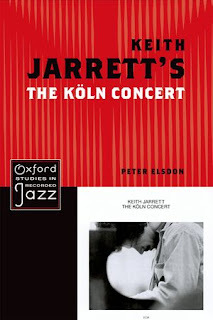 The Köln Concert was recorded in distinctly unpromising circumstances: Keith Jarrett was utterly exhausted (he had not slept for over 24 hours before the performance), had just bolted down an Italian meal in an overheated restaurant, and was so unhappy with the state of the instrument he’d been given that he later compared it with ‘a harpsichord or a piano with tacks in it’, and consequently played much of his solo concert, as biographer Ian Carr points out, in ‘the lower middle area of the piano [using] a lot of repetitive rhythms – because it is [there] that such rhythms “speak” and sound best’. Yet, as Carr goes on to point out, ‘within this narrow confine, he achieves the usual state of grace – the inspired state’, and such is the enduring power of the recording of the night’s music that the ECM albums (first a double LP, then a single CD) have now sold 3.5 million copies worldwide. Peter Elsdon, a jazz pianist who lectures on music at the University of Hull, attempts to anatomise this phenomenon in a number of ways: contextualising the concert (both widely, in terms of jazz’s 1970s reception in Europe, and more narrowly, in terms of Jarrett’s other dates on the same tour, as well as by looking at other contemporary solo piano recordings); examining the fundamental nature of improvisation; speculating about the reasons behind the music’s rapturous reception, both on the night and subsequently on record; philosophising about recordings as artefacts and ‘texts’; and scrupulously examining the music itself courtesy of the authorised 1991 transcription by Yukiko Kishinami and Kuniko Yamashita. All these avenues of enquiry are intelligently (and surprisingly readably) explored by Elsdon, and the book as a whole is a thought-provoking, tightly focused and scholarly piece of work, of considerable interest not only to Jarrett aficionados, but also to anyone fascinated by the processes involved in playing, listening to and marketing music. Each reader will no doubt seize on one of said avenues as of particular interest to him or her; my own preference is for the speculation concerning the music’s popularity. One only has to glance at the comment section of Sebastian Scotney's recent review to see just how violently Jarrett still divides opinion: admirers see him as a uniquely inspired (and inspirational) figure; detractors think him grossly overrated, even going so far as to say he is ‘to the music world what Jack Vettriano is to the art world’. I must confess to having some sympathy with the latter view, having held a somewhat less vitriolically dismissive, but none the less negative opinion of his work until relatively recently. I’d seen him in concert on numerous occasions, and been put off not only by what I then saw as the unthinking adulation of his followers (many of them – horrors! – not Proper Jazz Fans At All), but also by the grimacing and grunting that I considered disfigured his performances. I now see the former reason as (almost) pure snobbishness, and the latter I’m prepared to accept (as dear old Ian Carr always used to insist it was) as signs of Jarrett’s having achieved the aforementioned ‘state of grace – the inspired state’. And the reasons for this conversion? Two albums: the recently issued Sleeper and the solo Rio, both of which I found simply enthralling, my reaction easily summarised in the phrase ‘What’s not to like?’ As with The Köln Concert (which, I blush to admit, I had not actually heard until a fortnight ago – but then I’ve never heard Headhunters either – go figure), these recordings are simply irresistible, showcasing all Jarrett’s strengths: an unerring ear for a well-turned, accessible but sophisticated melody; an ability to conjure extraordinary joyousness from rhythm alone; an inexaustibly fecund improvisational gift, wonderful dexterity and precision of articulation – I could go on. All these attributes, though, are instantly accessible to (non-specialist) audiences – anyone who is moved by music can appreciate Keith Jarrett – and The Köln Concert – coming at a time when large numbers of seriously dedicated listeners were looking, for musical satisfaction, beyond the rock they’d grown up listening to – hit the spot for a wide spectrum of album buyers searching for sophistication not necessarily obtainable from rambling, overblown concept albums with gatefold sleeves depicting incomprehensible cosmic events. Whatever the reason, The Köln Concert is to ECM what Tubular Bells(!) was to Virgin Records, so perhaps best leave the last word on the attractions of Jarrett’s solo improvisations to Joe Lovano: ‘[his] stuff sounds like written music, the way he moves his harmonies, he’s inside all the colour of the harmony and the rhythm together, not just playing what he wants; he’s letting one thing lead to the next ...’ Couldn’t have put it better myself. I agree totally with Chris Parker, whose description of the book is both precise and comprehensive. But we go separate ways after these two sections, because he then deviates from the role of a reviewer and speculates on other listeners'/readers' responses instead. This, a common practice among critics, avoids a profound, personal and perhaps critical evaluation of a product. Köln Concert appears to be a sacred cow to many and Elsdon delivers some thought-provoking facts on this. That Chris Parker admits not to know the Köln Concert as well as Headhunters from sonic experience, reads at first as a fine quip. But given it is true, it might open up another debate on the non-existence of a jazz canon. At the very start of such a debate I will put my cards on the table and admit that I definitely have sonic blind spots too.